Big Sky Salers, Angela, MT. 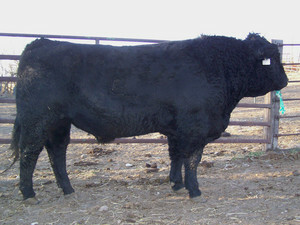 TRITON was the $10,400 high-selling bull of the 2006 Salers Focus sale. TRITON is long-sided with lots of thickness, stifle and performance along with an outstanding disposition. His first calf crop is proving him to be a very consistent and reliable calving ease sire with shorter than average gestation. 31 calves born to date at MacDonald Ranches have an average birth weight of 79 pounds with similar results at Elm Creek.